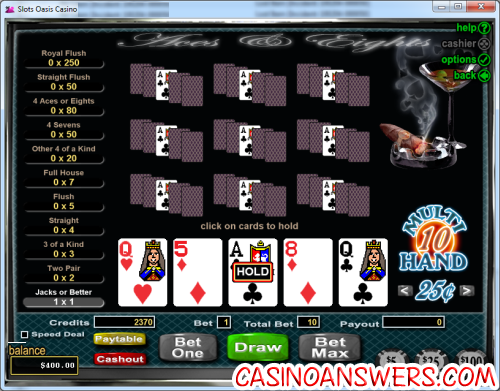 Aces and Eights Video Poker Guide & Review - Casino Answers! Ah Aces and Eights – the dead mans hand! Aces and Eights is a video poker game found at online casinos like Slots Oasis Casino, Lucky Red Casino and Cherry Red Casino. That is the multiple hand version. Aces and Eights video poker differs from basic video poker in that it offers special payouts if you get four of a kind aces, four of a kind eights, or four of a kind 7s. For example, betting 1 coin you get a 20-1 return on a 4 of a kind, a 50-1 return on 4 7s, and a 80-1 return on 4 Aces or 4 Eights. Aces and Eights also has the Double or Nothing Bonus Round. In this Video Poker bonus round you have the ability do double your winnings from the previous hand, by selecting a card that is higher than the dealers card. Aces and Eights Video Poker also comes in many different variations, allowing you to play multiple hands at once. For example at Slots Oasis Casino, you can choose from playing 1 hand of video poker, 3 hands, 10 hands, 52 hands or 100 hands all at once. If you are looking to play Aces and Eights Video Poker, for play money or real money, we recommend Lucky Red Casino. Their software is very slick and fast, and if you are a real money player they offer an amazing 400% to $4,000 signup bonus. Click here to visit Lucky Red Casino. Does Aces and Eights have a special payout? Aces and Eights pays out from a hand ranking of Jacks or Betting or higher. However Aced and Eights, at the expense of hands like a royal flush, will give special bonuses for quad aces, quad eights and quad 7s. The amount of the payout depends on how many coins you bet at once.